Opening Champagne Bottle for the first time ? Here are the tips. Champagne is the greatest drink ever! And a Champagne bottle is the party starter for any celebration. Be it a wedding, a promotion party, an anniversary party or birth of a child. Reasons for celebration could be many but a Champagne bottle is the best way to start one. First thing you need to make sure, before opening a Champagne bottle is, that it should be chilled. Champagne tastes best, when served at 7°C. Don't make it too cold or warm. As, if the Champagne will be warm, it will spill in foams, when you uncork it and if it is too cold, it looses its flavor. The best way to chill your Champagne bottle is by using a trendy ice bucket. Using an Ice bucket gives you the right temperature to make your Champagne perfectly chilled and makes it look classy too. Fill your bucket with ice and position the bottle tilted. You can add some salt to speed up the cooling process. Keep the bottle for 15-20 minutes in the ice bucket and your Champagne will be chilled, just right. Now peel off the foil paper from the neck of the bottle. These foils are usually made of up aluminum or tin. If the foil is giving you a tough time, very confidently twist the foil left and right and then pull it off. After you have peeled off the foil paper, you need to untwist the wire cage. There are two different things that people follow. Some people only loose the wire cage and others remove it completely. Removing the the wire cage has one disadvantage, that the cork might just pop out the moment you untwist the cork. This can occur if a lot of pressure has built inside because of the way, the bottle had been carried or stored. Loosening the wire cage will prevent the cork from flying off. After untwisting the wire cage, dry the bottle with a towel to attain a good grip and then drape the towel on top of the bottle and hold the bottle upright. It is important to use a towel so that, if the cork pops out or the champagne leaks, it will remain in the towel, in case the uncorking act gets messed up. Get a good grip of the cork with the towel using one of your hands, with a thumb over the cork and other fingers supporting the neck. Use your second hand to hold the body of the bottle firmly, and turn the bottle, gently. Don't let go the cork until, it is completely out of the bottle. And, DO NOT TURN THE CORK! As soon as the cork is out of the bottle, you will hear a pop sound. This sound could be loud or soft. However, a bottle is said to be perfectly opened if the following sound is a soft pop. 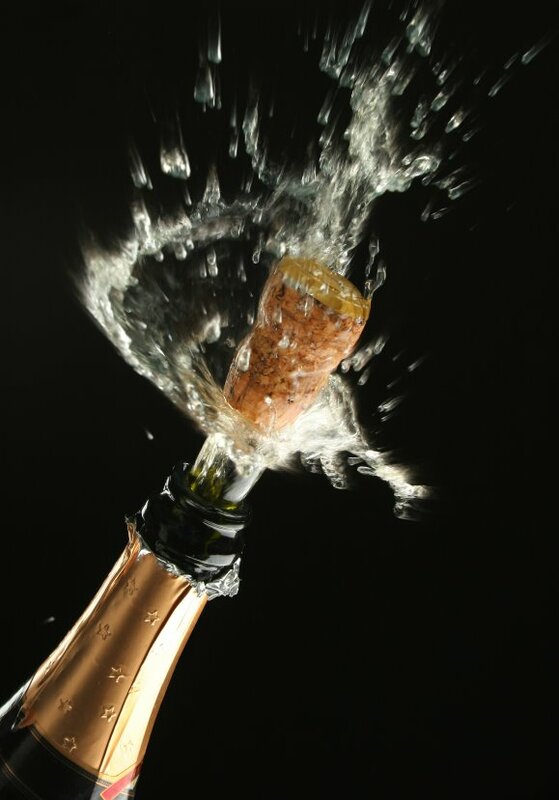 A soft pop sound indicates that carbonation is retained, where as, a loud pop indicates that a major amount of bubbles have escaped along with some Champagne. So, get the soft pop sound to have perfectly opened a Champagne bottle. Now, proudly get away with the towel and get ready to pour the Champagne. A tip, when you serve Champagne is, use your best Champagne glasses and pour about 4-5 ounces in each glass. The best way to pour Champagne is by pouring it like beer as it retains maximum carbonation. Serve the Champagne to your guests with oysters, light cheese or fruits. Now finally, a tip when you are drinking the Champagne; make sure you hold your glass from the stem and not by its bowl, as this will warm your champagne quickly. This tip sums up the entire act of opening a Champagne bottle. Opening a champagne bottle, for celebration, will never go out of fashion. You will be doing it throughout your life on different occasions. 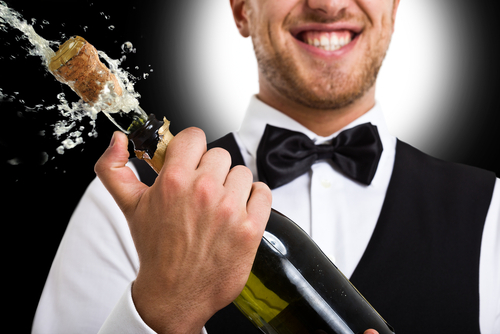 If your big-day is close or if you want to simply raise a toast to something or someone and you want to get the act of opening a Champagne bottle just right, follow the above given tips and I bet you'll pop it just fine! Here is a great explainer video from winefolly.com . For The First Timer - Business, Startups, Health, Parenting, Lifestyle, Travel and more: Opening Champagne Bottle for the first time ? Here are the tips.